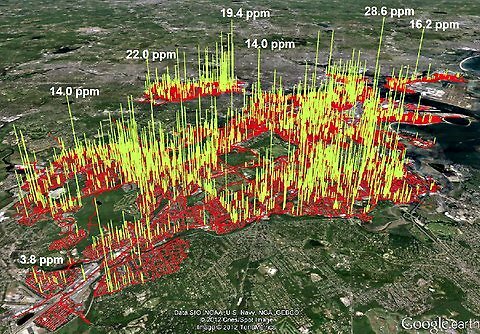 Natural Gas Leaks pose major threats to our environment and health by polluting our air with greenhouse gas. Methane is 40 times more polluting than carbon and is the largest component in natural gas. Consumers like you are paying for the leaking gas every month on their utility bill. One estimate says ratepayers have spent more than $1 billion dollars on these leaks! Our Boston chapter is working to have gas companies seal all gas leaks and pay for wasted gas. Boston Climate Action Network (BCAN), aided by environmental justice organization Project Right, is lobbying the State House on behalf of unheard citizens to ensure natural gas leaks are addressed. Last year they successfully lobbied for a bill which requires gas companies report the location and age of all known gas leaks, fixed or not, to the Department of Utilities. Our goal is to plug all significant gas leaks to save gas, money, and our climate. In addition, we believe the gas companies should be paying for the leaked gas rather than the customers. As work is being done to fix roadways, broken gas lines should also be sealed to prevent further leakage. Consumers should not have to pay for the lack of effort from gas companies.